iPlanner.NET is a collaboration based business plan software that is secure and fast.The software helps enhancing project development process by getting ideas from all the team members.The software contains important features namely iPlanner business and financial planning application, which helps connecting the main areas of the corporate financial functions.The tool features "what-if” financial modelling, while the “Performance” module contains the economic activities of an organization on short time basis.Every iPlanner business plan comes with different web address so that accessing the plan becomes convenient. How much does iPlanner.NET cost ? 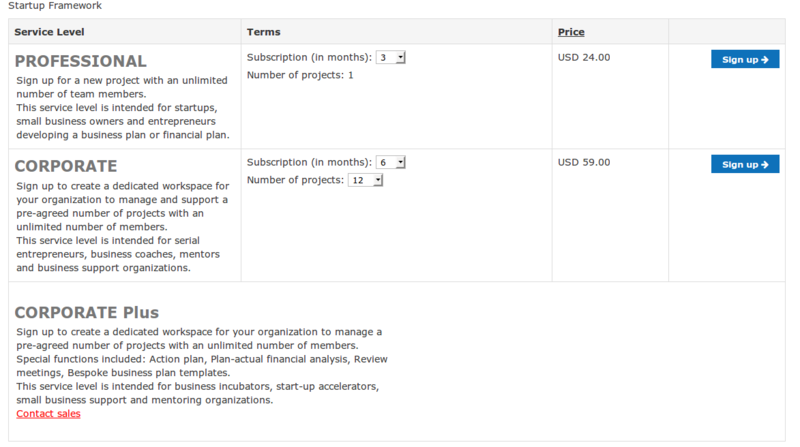 The pricing for iPlanner.NET starts at $24.0 per month. iPlanner.NET has 2 different plans such as - Professional at $24.0 per month and Corporate at $59.0 per month. iPlanner.NET also offers a custom plan based on the customer's request. Based upon subscription (in months) the pricing values differs.Contact the vendor to get the detailed pricing information. Based upon number of projects the subcription for month differs. Contact the vendor to get the detailed pricing information. Special functions included: Action plan, Plan-actual financial analysis, Review meetings, Bespoke business plan templates.This service level is intended for business incubators, start-up accelerators, small business support and mentoring organizations. Comments: This is a truly viable solution to a problem of the collaboration on an exhaustive documents with multiple users. Prior to iPlanner's Strategy Designer we were using Microsoft Office, Dropbox, Google Drive for creating our strategic Business plans. Everything had seemed somewhat disconnected. Working with a multitude of users always ends up with multiple documents created. Some extra attention has to be applied when piecing together all the created work, and things start to slow down or even cause various confusions. Although, the documents could be tracked via Microsoft Office's document tracking function, the human factor still had played its role occasionally. All in all, the process was onerous. When we introduced iPlanner's Strategy Designer into our Business plan making process we improved our efficiency significantly. With iPlanner's Strategy Designer it has now become possible to manage and share all the documents from a single cloud based service. It's a straightforward service, limited to strategic business plan creation only which is a huge advantage for such corporate environments like ours. The ability to upload all the work files straight into the Business plan is our favourite feature. This is one of the best investment we have made so far. As an individual consultant I often employ outsourced staff who are involved in designing the Business Plan documents. The biggest problem ww were usually faced with was working in correlation between our work processes. With all these wonderful tools of Microsoft Office, Dropbox, etc., it still could turn into a mammoth of task to complete the Business Plan in an efficient and timely manner. Never mind the mistakes which were occurring because of the multitude of people involved and the documents created. Acquiring iPlanner's Strategy Designer has enabled us to combine all of our work tools into one place. Now instead of creating multiple documents, everything is being directed to and stored in one place. Strategy Designer kind of combines the Microsoft Office and Dropbox. It is very simple to use, hence, perhaps, the lack of User manual. The only downside could be a price. Although, it is very reasonable for larger corporate entities, it may not look very friendly towards smaller businesses. The service works only online which might not be an option for everyone. Overall it is a great product and well worth its money. Also, the support offered by the iPlanner team is very quick and accurate.Evrything is brought together in one place (document). Very intuitive in using - easy to use. Quick responses from customer service. Evrything is brought together in one place (document). Very intuitive in using - easy to use. Quick responses from customer service. Probably, slighlty too expensive for small businesses. Comments: The iPlanner.NET Strategy designer provides a detailed and versatile setup for collaborative planning among many different team members in an organization. Cloud based collaboration such as this is particularly useful in that it eliminates the necessity for additional IT hardware. The cross platform availability is particularly useful when different team members are using different hardware to access the Strategy Planner. Price wise it¿s very reasonable for both small businesses and larger corporate enterprises. One downside is the lack of an offline version. Users who wish to work on a particular plan while in an environment that lacks connectivity will have to wait. The ability to work in an offline mode and then integrate back into the online mode would be useful. From a security standpoint, more detail about how the data is stored in the Cloud and how that data is protected would be useful in a cyber security audit situation. One definite upside is the multiple output tools, where the final document can be exported to Microsoft Word, HTML, or as a PDF file. This ensures that the final document can be viewed by as many people as possible. In all, I would definitely recommend this product for a variety of different management teams. I believe they would find it extremely useful. Mark Many thanks for reviewing our cloud-based strategic plan creation tool. We will analyze all of your valuable suggestions, especially the remark about adding more details on cloud security. Also, be informed that we plan to add special strategic plan templates for non-profit organizations. Will keep you posted when the first outline is ready. Comments: As a Coordinator of the research cell of the Institute, one of my key responsibilities was to build the annual plans and flowcharts to carry out the research and development activities in the department. A very hectic task, though. Meanwhile, I came across iPlanner.NET by NetEkspert and life became easy. Though it's a simple program, iPlanner.NET includes templates and tools needed to create a variety of business plans, including ones for start-ups as well as growth and marketing plans. 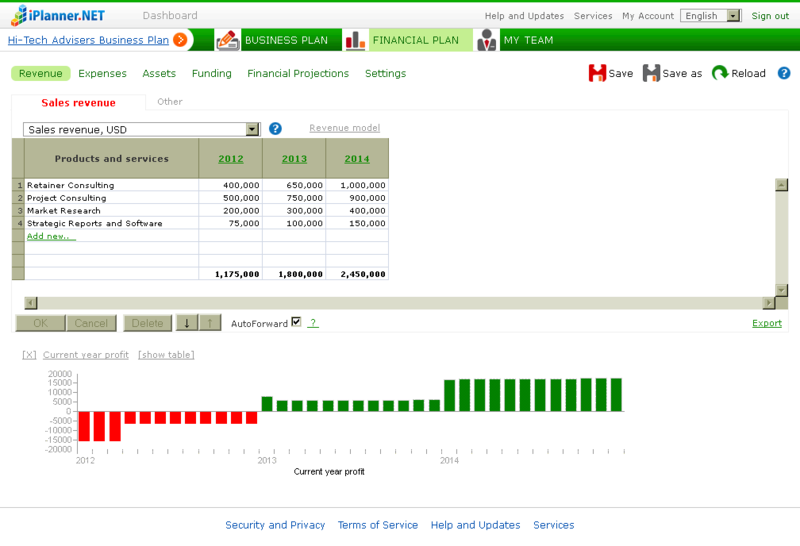 With iPlanner.NET, you can import financial information from other accounting programs. It also has step-by-step tutorials for each section of the business plan and financial calculators and chart generators to help make financial analysis easy. I also encourage my students to use this tool for their project works. Vishal, Thank you for reviewing our business plan creation software. For your information, we are planning to add special plan templates for non-profit organizations. We will keep you posted when a template for non-profit strategic plans will be ready. I have been using Iplanner.net to prepare business plans for my clients. It’s quite useful as there is a template ready to just gather the information you want and fill in the details. For some clients who have more stakeholders to provide information, I request them to order a basic plan and guide them the way to use it. Makes their work also easier (mine too) and transparent. As it allows all formats (XL/PDF), texting and uploading capabilities, anyone with basic computer skills can use this. A basic requirement is to be online to use this as it is an interactive guide and only English language is used during the interaction. Plans can be drafted in any language once you have understood the basic way it works, makes work easier when you have clients speaking different languages. The basic version is a bit expensive for small businesses but looking at the benefits it worth ordering. For a Business Consultant like me life has become stress free!Many stake holders can work at the same time contributing their data to the plan Accepts all formats. Texting and uploading features. Many stake holders can work at the same time contributing their data to the plan Accepts all formats. Texting and uploading features. Only online, cant work offline. Basic English knowledge required. Many thanks for taking your valuable time and writing about our business plan creation tool! - May feel a bit "complicated" for these not aware with basic accounting concepts and economic terms. - Works online only, no downloadable version available.